$18 million in funding, 1 crack team of PC enthusiasts from Israel and 3 million downloads. Those are the numbers that Soluto has going for it. The app, which allows you to run remote diagnostics on your computer, finding the problem spots, has inarguably been a success since launching last year. But with that success comes user feedback, and the Soluto team has found that it’s time for a change. That change is a pretty huge move, but it still accomplishes much of what the company has done all along, while adding new features. 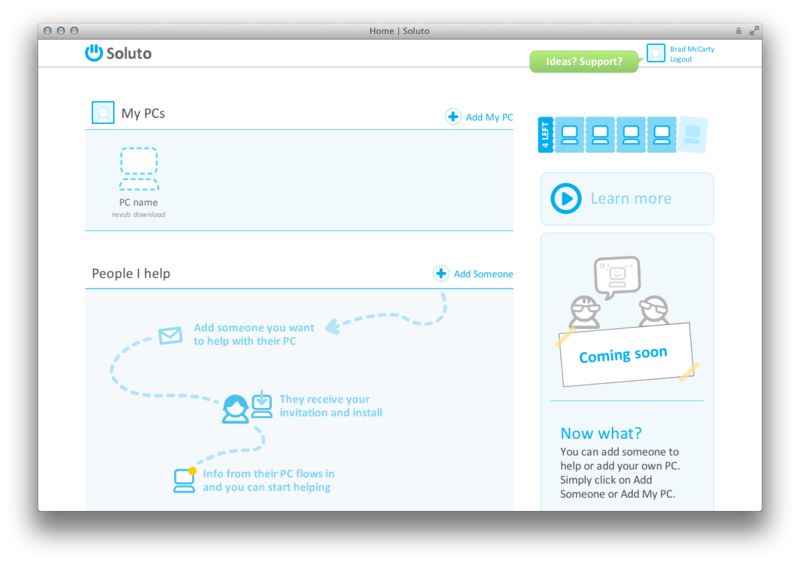 Soluto is moving its entire product to a browser-based solution which will allow any Windows user to give assistance to another Windows user remotely. This might sound familiar, especially if you have already used services such as GoToMyPC, LogMeIn or even Windows’ built-in Remote Desktop feature. The advantage, however, is that you have Soluto’s “fix anything” software at your fingertips, you just get to use it on everyone else’s computer instead of finding and fixing the problems yourself. Once you’re signed up, it’s a simple process of installing a small piece of software on your own computer, then sending an invitation to those that you’re going to be helping. They’ll get an email, saying that you’d like to help them with their computer, and then be prompted to install the software for themselves. Once they do, they’ll show up in your “People I Help” section. The other interesting part is that Soluto lets you play technical advisor to your family by adding up to 4 different people. The interface is hugely powerful, enabling you to not only install applications, but also track down micro-scale problems like hung applications, items causing slow boot times and even hardware reports. 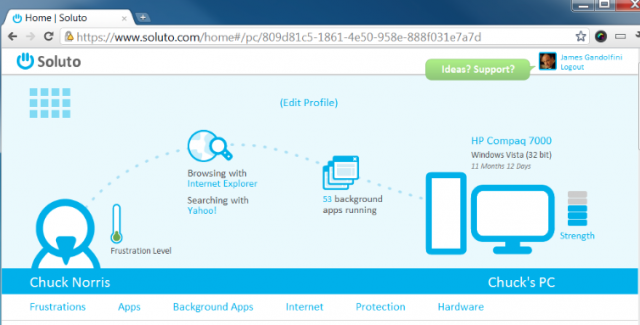 In short, it’s the same, powerful software that Soluto has always provided, but now it’s set up so you can use it on anyone’s Windows machine. The caveat, of course, is that you have to be on a Windows machine yourself. But Soluto’s product guy Roee Adler assures us that a Mac client, as well as a mobile client, are on the horizon, so Mac and mobile users will be able to fix Windows PCs too. If you can’t see where this is going, let me lay it out there for you — Soluto is aiming for the professional PC troubleshooting market. There’s a business to be had here, both on Soluto’s part and on the part of those interested in making life easier for others while pocketing a few bucks in the process. For those who just want to help a family member, it will still be free, but Soluto will be charging professional users (and opening up more than just the 4 slots, for those who pay). What’s really interesting about this is that it flies right in the face of Microsoft’s AnswerDesk.com launch. While AnswerDesk is staffed by Microsoft, Soluto puts the power into the hands of anyone savvy enough to use its product. That’s a big move, and it’s one that will keep the market interesting for your local competitors. So head over, sign yourself up with the “bradsentme” code and let us know your thoughts. While many of us would rather not be our family’s on-call IT guy, that’s how it ends up, so we might as well use the tools that make the job as easy as possible.